recently discovered a software that gives you all the premium privileges while downloading from Rapidshare. It’s called Download Direct. You just add the URL of your file and download Direct will take care of the rest. 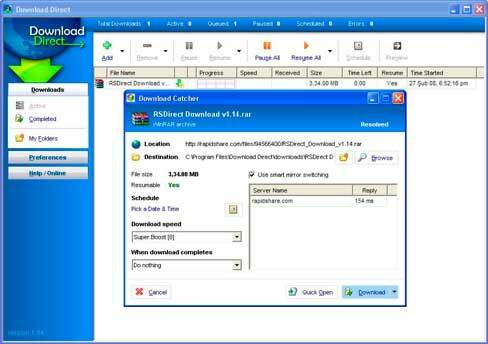 • No Download limit-Download as many as files you want to. • No Download speed limit-This software can download at unbelievable speed-max out of your network connection. • Resume Downloads -Start and pause downloads as many times as your wish. • Supports Rapidshare and torrent downloads. • Finally you don’t have to buy a premium account from rapidshare by spending bucks from your pocket or wasting time taking any surveys. Was this software helpful ?